When I produce a piece it becomes a narrative, the tale of a journey. Objects discovered on the shoreline find themselves becoming part of the story…I use a variety of decoration techniques as my ideas continue to flow and move on to create different avenues and new approaches. 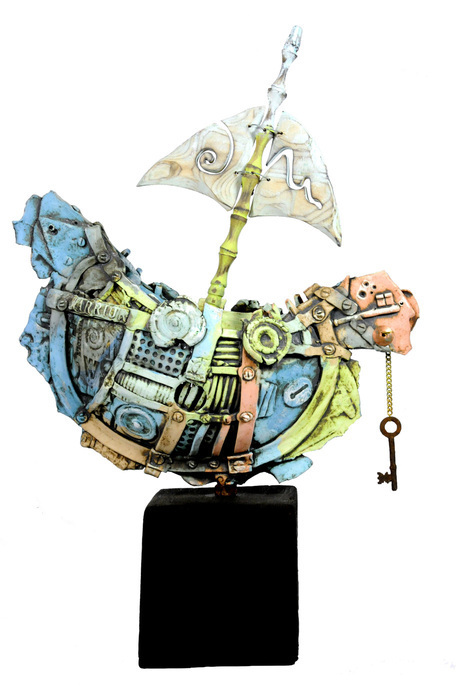 Ships, boats, and wrecks are the main fabric of the work, made from clay that has the textures of metal and wood objects salvaged, press moulded, and patched together to produce a variety of forms that look as though they have sailed the Seven Seas.